Hog Roast Catering For A Local Tennis Club In Bothwell! Wimbledon may be the most highly regarded event in the tennis calendar, but for true tennis fans, the other grand slams are just as important and watched with equal enthusiasm. A local tennis club, who train together twice a week and compete in matches with other clubs on a fortnightly basis, decided to get together to watch each of the grand slam finals this year and make a bit of a party out of it. After their first grand slam gathering for the US open had been a bit slap dash, with just a few mismatched nibbles (and apparently a few technical problems with the TV in the bar area! ), the tennis teammates wanted their viewing of the French Open final to be a more organised and relaxing experience, so they could enjoy the match without missing any of the action due to technical issues or fussing with the food. The team captain Chris assumed responsibility for sorting out the catering, and he was very pleasantly surprised to discover after reading some of Hog Roast Bothwell’s reviews, that we don’t just provide perfect hog roasts, we also offer a range of alternative meats, all prepared using the same impeccable slow-roasting method! Chris knew he was on to a winner, and as the final was taking place on a Sunday, he selected our extremely high-quality version of Sunday lunch: slow-roasted sirloin of beef, served with homemade Yorkshire puddings, horseradish sauce and our own decadent red wine gravy! We were asked to keep a low profile during the match and time our service to be ready for the conclusion of it. As we always plan ahead, the timing is never an issue for us, and we always listen carefully to everyone we cater for, to ensure our style of service is appropriate and will not interfere with the order of play! 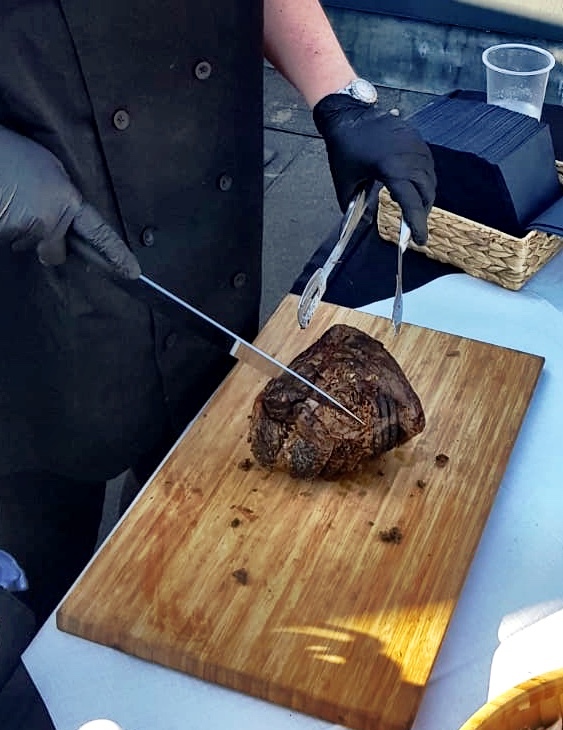 As Nadal trounced his overwhelmed opponent Dominic Thiem in straight sets, the Hog Roast Bothwell team were slogging away off the court to give the tennis fans the perfect meal to celebrate their hero securing his 11th Roland Garros victory! As everyone eagerly tucked in after the trophy ceremony, everyone in the club agreed the delicious food was a world apart from their own previous attempt at grand slam catering and they wished they had hired Hog Roast Bothwell from the outset!